Back in October, I was asked to participate in an online photography and storytelling project called Someone Once Told Me, started by Mario Cacciottolo. He showed up at the Coach and Horses for Tuttle Club on the one day of my trip to London I was able to make it, and he asked just about everyone in the room to write someone someone once told them on a piece of paper and then to hold that up for the camera. Some people put down serious words of wisdom. 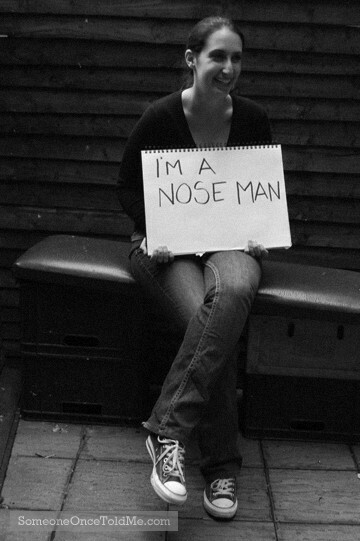 I, for some reason, immediately thought of one of the most bizarre things someone had told me: “I’m a nose man.” Now, I’ve always been self-conscious about my nose, as I’ve been teased about it and told it was big since I was a kid, so to have a strange older man approach me in a bar and tell me that he loved my nose and that he was a nose man threw me off quite a bit. I had no interest in this stranger, but the strangeness of his comment stuck with me. I believe on his second shot at picking me up, he came on even stronger and that “That’s a nose I could settle down with”! Whoa, buddy, we were at a cheesy karaoke bar in Newport Beach. Not a time for grand nose-themed gestures. I must say, though, I’m honored to be part of the project, and excited to finally see my photo up on the site. I think it turned out quite well. Our first whole day in London, Evan and I decided to do some touristy things we hadn’t gotten around to when we were living there. 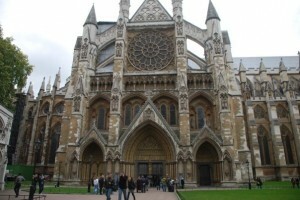 We started with a trip to Westminster Abbey. We were a bit turned off at the £12 entry fee to go into a church, but my parents had strongly recommended it, so we went ahead. Thankfully, that entry fee includes an audio guide that gives a great tour of the church. You can move from item to item on the tour without always stopping to punch in numbers, its segments are short and to the point, and there are extra info segments you can listen to if you want. It also has a full-color screen with titles and pictures of the things you’re seeing, and even a few videos about areas of the church that are inaccessible to those in wheelchairs. We were seriously impressed with the attention to detail, timing and the flow of the tour that was put into the place, which really helped us enjoy walking among the tombs of kings, queens and notable artistic and scientific figures. Next we headed over to Trafalgar Square, where we noticed that St. Martin in the Fields was FINALLY free of scaffolding — we’d never seen it like that. We stopped in to check it out, and were surprised to find a concert rehearsal in progress. We sat down and listened to the small orchestra of about 15 musicians practice Mozart’s Requiem for a concert that evening. It sounded great, if a bit echoey in the mostly empty church, and we stayed for about 30 minutes. The free concert was a wonderful surprise. Since we were already in Trafalgar Square, we decided to check out the National Gallery since Evan had never been and I’d only been on a rushed walk-through on the tail-end of my parents’ visit. They were holding an education program with artists leading drawing classes, and they were handing out pencils and paper at the information desk, so I grabbed one and went on a search for something to draw — next to a nice comfy couch for Evan to sit on. 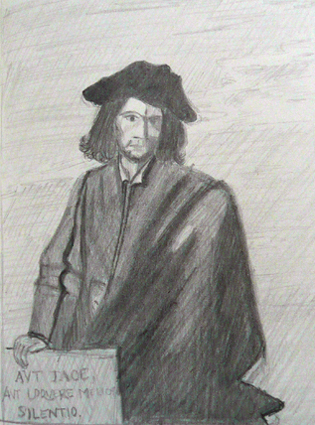 I didn’t join one of the bigger groups, but settled on Salvator Rosa’s self portrait, in which he looks like a pirate (though he was actually dressed like a scholar according to the information card). I would have worked on the drawing a bit longer, but the fire alarm went off, and we were evacuated. Since the evacuation occurred right at closing time, we just headed up into Soho where we were meeting friends and grabbed drinks at the very cute new Las Iguanas on Dean Street before going to Gopal for an Indian dinner. We also made it to the last Tuttle Club at the Coach and Horses on Greek Street that morning, had a quick lunch at the yummy Just Falafs, which has a menu as punny as you would imagine, and warmed up with a hot chocolate break at Pret — they really have the most delicious hot chocolate. Check out our photos in Evan’s Facebook album. I finally made it to another one of Andy Bargery‘s blogger meetup — this time at the Coach & Horses — and had a nice evening catching up with Londonist folks, seeing some people I hadn’t seen in a while and meeting a few new ones, too. I worry that since I know some people at the events now, I don’t spend as much time mingling as I should. It’s always nice to catch up with people, but I need to find a balance between meeting new people and spending time with the people who I only really see at events like this. The best moment of the night was when I was chatting with TikiChris, the food and drink editor for Londonist, and meeting a new Chris, who said, “I just emailed with someone from Londonist… Francine…”! Of course, I told him that it was me and introduced myself. He works for is doing some work for Lactofree, and had found my blog and emailed me about my Lactofree posts, and we’d been exchanging emails just a few days earlier. We had a good chat about lactose and food allergies, and he said some new Lactofree products are in the works. I was happy to see M@, Dave and TikiChris from Londonist, Siany, Annie Mole, Tim, Peter, Andy Roberts, and Melinda. And it was nice to meet some new people like Chris, Tom and Jaz. I also met Malcolm, who blogs about breakfast, so I had to do a bit of ranting about how I haven’t actually found a very good breakfast here yet. He says Americans just don’t like British breakfasts (I could agree to that). I did get some good recommendations, though, and I’ll be trying some out — top of my list is the Wolesley. Sorry if I forgot to mention anyone… it was quite a busy night! Well, it’s been a busy week to say the least. 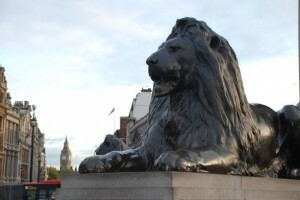 I started an internship at Hachette Filipacci, wrote a new Entrepreneur.com article (you’ll see it soon) and still managed to write Londonist posts four out of five days. I also managed to make it to the Museum of London for a pub quiz last night with the Londonist crew. I was pretty useless at answering questions since they were all about London (I think I knew 2), but I did excel in the arts and crafts bonus round, helping create an interactive, turning version of the London Eye, which we’d like to fondly call the Londonist Eye, out of paper straws and pipe cleaners. (In the photo, it’s nearly finished). Lindsey wrote a good post about it this morning, which really describes the evening well. Today I went to Social Media Cafe at the Coach and Horses to catch up with my Friday morning friends, and went to lunch with the much more daunting sounding Social Media Mafia, which is actually a lovely group of people. We had curry on Brick Lane — my first time there — which ended up being a long and leisurely lunchtime feast. I’m still recovering. Will a Bullet-Proof Hoodie Ruin Your Street Cred? Today I got myself out of the house for almost the entire day by going to the Social Media Club/Tuttle Club. Now a weekly event every Friday starting at 10 a.m. at Norman’s Coach and Horses on Greek Street in Soho, the group is a lively confluence of professional marketers, bloggers, developers and social media types. Though I tend to be nervous walking into a room of strangers — or almost all strangers, since I did know a couple of people — I felt welcomed immediately and sat down to have a cup of tea and a croissant with some newfound friends. It was nice to chat about writing, blogging, marketing and to hear about people’s startups. And I ended up staying for the QR code lunch as well. I only learned about QR codes a few weeks ago — they’re not really used in the U.S. yet — so I felt like I should learn a bit more. Basically, they’re square-shaped bar codes that sort of look like TV fuzz that can encode urls, text information, v-cards (virtual business cards) and more. These codes are then used as shortcuts for mobile phones — the user takes a photo scan of the code and it displays the encoded information or takes them to a specific website. The QR pros today were from i-nigma and Squiggly Square, and they had some interesting uses of the tech to talk about — both ones that had been done and some theoretical applications. Basically, it gave me a good deal to think about, and I learned some new things. And, of course, I had to create code that’ll get you to my portfolio site (above). If anyone checking this out has a bar code reader on their phone, let me know if it works.